There was an abundance of energy in the Open Air Theater. Picture a sea of faces, the blaring roar of anticipation and, suddenly, the lights go out. The opening guitar riff of "Runnin' Down a Dream" barely made it over the mountain of sound created by the audience. Fast-paced, upbeat—whether you were a fan of Tom Petty or just had tickets, you loved it. The lights, still dim, bounced off the Persian carpet onstage and colored the band a deep red as Petty moved toward the crowd and stirred the already-hyped audience. He wore a gray beard and let his hair fall over his ears, showing the audience that even rock legends get old. But, the night was a lesson that great music has no age—Petty and his ability to pack stadiums and delight audiences is immortal. Crystal chandeliers hung from the top of the stage and, coupled with the carpet, created an ambiance of Royalty. Then, Petty sang "It's good to be king," and his loyal subjects agreed. He connected with every corner of the audience, bringing some a little closer to the stage than their tickets allowed. Security guards kept a watchful eye, but determined fans were able to sneak from the back row to the front, where they hoped to snag souvenirs like guitar picks and drumsticks. 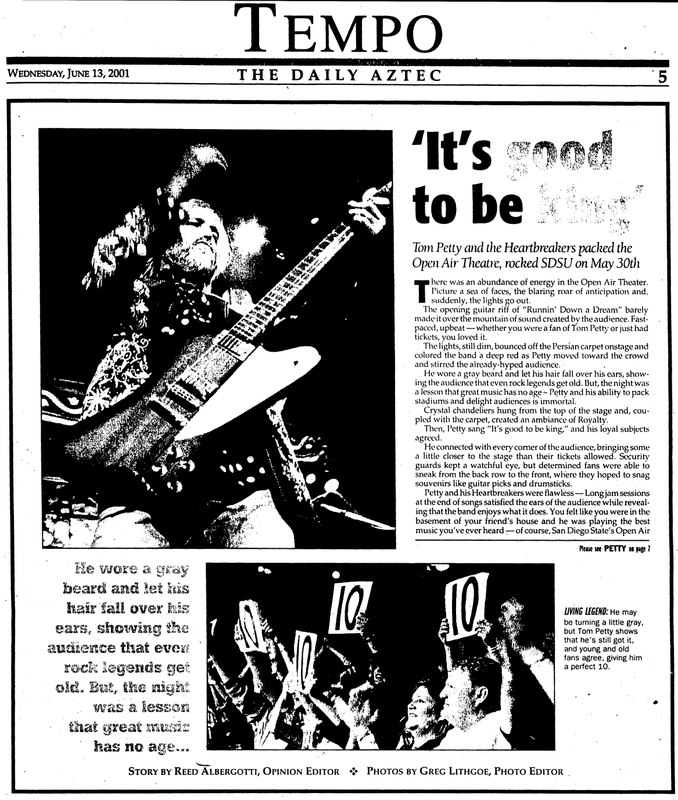 Petty and his Heartbreakers were flawless—Long jam sessions at the end of songs satisfied the ears of the audience while revealing that the band enjoys what it does. You felt like you were in the basement of your friend's house and he was playing the best music you've ever heard—of course, San Diego State's Open Air Theater has slightly better acoustics than a basement. It was the personal element of the concert that made it unlike any other "big show." 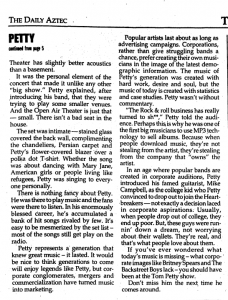 Petty explained, after introducing his band, that they were trying to play some smaller venues. And the Open Air Theater is just that—small. There isn't a bad seat in the house. The set was intimate—stained glass covered the back wall, complimenting the chandeliers, Persian carpet and Petty's flower-covered blazer over a polka dot T-shirt. Whether the song was about dancing with Mary Jane, American girls or people living like refugees, Petty was singing to everyone personally. There is nothing fancy about Petty. He was there to play music and the fans were there to listen. In his enormously blessed career, he's accumulated a bank of hit songs rivaled by few. It's easy to be mesmerized by the set list—most of the songs still get play on the radio. Petty represents a generation that knew great music—it lasted. It would be nice to think generations to come will enjoy legends like Petty, but corporate conglomerates, mergers and commercialization have turned music into marketing. Popular artists last about as long as advertising campaigns. Corporations, rather than give struggling bands a chance, prefer creating their own musicians in the image of the latest demographic information. The music of Petty's generation was created with hard work, desire and soul, but the music of today is created with statistics and case studies. Petty wasn't without commentary. "The Rock & roll business has really turned to sh**," Petty told the audience. Perhaps this was why he was one of the first big musicians to use MP3 technology to sell albums. Because when people download music, they're not stealing from the artist, they're stealing from the company that "owns" the artist. 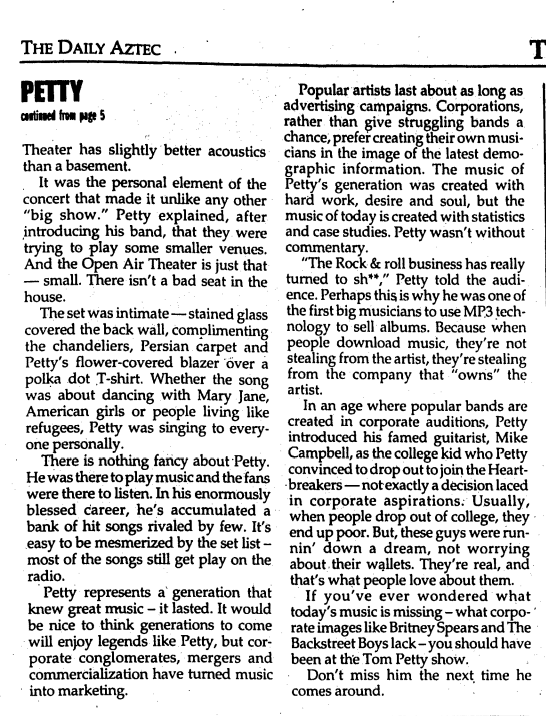 In an age where popular bands are created in corporate auditions, Petty introduced his famed guitarist, Mike Campbell, as the college kid who Petty convinced to drop out to join the Heartbreakers—not exactly a decision laced in corporate aspirations. Usually, when people drop out of college, they end up poor. But, these guys were runnin' down a dream, not worrying about their wallets. They're real, and that's what people love about them. 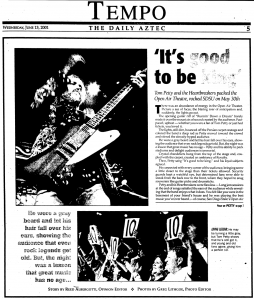 If you've ever wondered what today's music is missing—what corporate images like Britney Spears and The Backstreet Boys lack—you should have been at the Tom Petty show. Don't miss him the next time he comes around.